The global urinary incontinence treatment devices market is driven by high prevalence and rapidly increasing incidence of urinary incontinence across the globe. The global market was valued at US$ 2.21 Bn in 2018 and is projected to expand at a CAGR of 7.5% from 2019 to 2027 to reach US$ 4.20 Bn by 2027. High growth of the market is attributed to increase in adoption, easy availability of electrical vaginal stimulation devices, and rise in demand for minimally invasive or non-surgical products across the globe. Urinary incontinence is defined as involuntary release of urine due to loss of bladder control. Millions of people across the world are affected by urinary incontinence and women are more likely to be affected than men. Urinary incontinence is highly underreported primarily due to embarrassment to speak about it. Over 500 million people across the globe are affected by the condition and its incidence increases with age. Several factors such as urinary tract infection, weakening of pelvic floor muscles & urethral sphincters, menopause, pregnancy & childbirth, and post radical prostatectomy surgery in men lead to the development of urinary incontinence symptoms. According to the International Continence Society, around 12% (both men and women) of the global geriatric population is affected by overactive bladder and its incidence increases with age. In the past few years, various treatment devices such as urethral slings, electrical stimulation devices, artificial urinary sphincters, and catheters have been developed and are increasingly used for effective management of urinary incontinence. Rise in demand for minimally invasive surgery and non-invasive treatment devices and new product launches in the electrical stimulation devices segment are projected to accelerate the growth of the global urinary incontinence treatment devices market during the forecast period. The global urinary incontinence treatment devices market has been segmented based on product, incontinence type, end-user, and region. In terms of product, the market has been classified into urethral slings, electrical stimulation devices, artificial urinary sphincters, and catheters. The urethral slings segment has been bifurcated into female slings and male slings. The female slings sub-segment dominated the urethral slings segment in 2018. The sub-segment is projected to gain market share from 2019 to 2027. The electrical stimulation devices segment has been categorized into implantable and non-implantable. Medtronic plc’s InterStim device is the only implantable electrical simulation device available in the market for the treatment of overactive bladder symptoms. Vaginal electrical stimulation devices are widely used and demand for these devices is increasing significantly across the globe. Urinary catheters such as Foley catheters, intermittent catheters, and external catheters dominated the global urinary incontinence treatment devices market. High adoption of Foley catheters and intermittent catheters for emptying the bladder, technologically advanced products to prevent infection, and ease of use of intermittent catheters are attributed to the large market share of the catheters segment. Based on incontinence type, the global urinary incontinence treatment devices market has been divided into stress urinary incontinence, urge urinary incontinence, mixed incontinence, and overflow incontinence. The urge incontinence segment dominated the global market in 2018. The segment is anticipated grow at a rapid pace during the forecast period. In terms of end-user, the global urinary incontinence treatment devices market has been classified into hospitals, ambulatory surgery centers, clinics, and home use. The hospitals segment accounted for major share of the global market in 2018, followed by the ambulatory surgery centers segment. Increase in the number of multinational hospitals with advanced sling surgery techniques such TVT & TOT and adoption of mini slings are expected to boost the growth of the hospitals and ambulatory surgery centers segments during the forecast period. Geographically, the global urinary incontinence treatment devices market has been segmented into five major regions: North America, Europe, Asia Pacific, Latin America, and Middle East & Africa. North America accounted for the largest share of the global market in 2018, followed by Europe. Well-established health care facilities, favorable reimbursement policies, and early adoption of technologically advanced products for the management of urinary incontinence have contributed to North America’s large market share. Europe is projected to be the most attractive market for urinary incontinence treatment devices from 2019 to 2027. The market in the region is anticipated to expand at the highest CAGR during the forecast period due to high prevalence and increase in incidence of urinary incontinence in the region, recent launch of wearable electrical stimulation devices, and high per capita health care expenditure. The global urinary incontinence treatment devices market is consolidated, with small number of companies accounting for majority market share. Key players operating in the global market include Boston Scientific Corporation, C. R. Bard, Inc. (Becton, Dickinson and Company), Coloplast Group, Promedon Group, Medtronic plc, and Ethicon US, LLC. (Johnson & Johnson). These players exhibit significant geographical outreach, with presence in multiple urinary incontinence treatment devices segments. Manufacturers are adopting acquisition & collaboration and new product development strategies to tap the unmet needs of a large proportion of urinary incontinence patient pool. Other prominent players in the global urinary incontinence treatment devices market include ZSI Surgical Implants S.R.L., InControl Medical LLC, Hollister Incorporated, Atlantic Therapeutics Group Ltd., B. Braun Melsungen AG, A.M.I. GmbH, and Teleflex Incorporated. This report studies the current as well as future prospects of the global urinary incontinence treatment devices market. Stakeholders of this report include companies and intermediaries engaged in the manufacture, commercialization, and provision of medical devices for the treatment of urinary incontinence as well as new players planning to enter this market. This report comprises an elaborate executive summary along with a market snapshot providing overall information of various segments considered in the scope of the study. This section also provides the overall information and data analysis of the global urinary incontinence treatment devices market with respect to the leading segments based on product, incontinence type, end-user, and region. The global urinary incontinence treatment devices market has been segmented based on product, incontinence type, end-user, and region. In terms of product, the market has been classified into urethral slings, electrical stimulation devices, artificial urinary sphincters, and catheters. Based on incontinence type, the global urinary incontinence treatment devices market has been categorized into stress urinary incontinence, urge urinary incontinence, mixed incontinence, and overflow incontinence. In terms of end-user, the market has been divided into hospitals, ambulatory surgery centers, clinics, and home use. Each of the market segments has been extensively analyzed based on the market related factors such as increase in incidence and prevalence of urinary incontinence. Moreover, historical year-on-year growth has been taken into consideration while estimating the market size. The market size and forecast in terms of US$ Mn for each segment has been provided for the period from 2017 to 2027. The report also provides the compound annual growth rate (CAGR %) for each market segment for the forecast period from 2019 to 2027, considering 2018 as the base year. 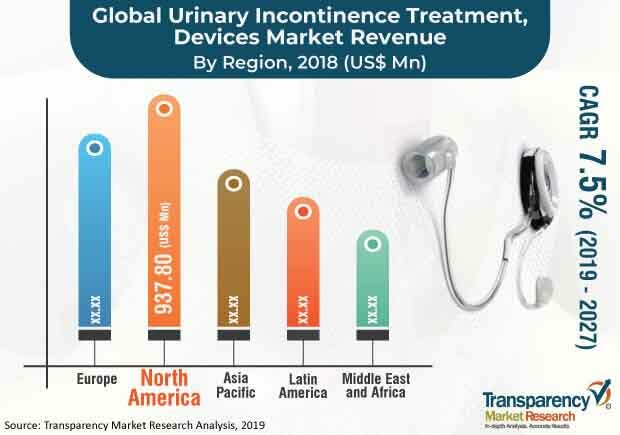 The overview section of the report explores the market dynamics such as drivers, restraints, and opportunities that currently have a strong impact on the global urinary incontinence treatment devices market and could influence it in the near future. Market attractiveness analysis has been provided in the overview section in order to explain the intensity of competition across different regions. The competitive scenario among different players is evaluated through market share analysis in the competitive landscape section of the report. All these factors would help players to take strategic decisions in order to strengthen their positions and expand their shares in the global urinary incontinence treatment devices market. Geographically, the global urinary incontinence treatment devices market has been segmented into five major regions: North America, Europe, Asia Pacific, Latin America, and Middle East & Africa. The market size and forecast for each of these regions have been provided for the period from 2017 to 2027, along with their respective CAGRs for the forecast period from 2019 to 2027, considering 2018 as the base year. The report also provides market size and forecast for major countries in the respective regions. A detailed qualitative analysis of factors responsible for driving and restraining the market and future opportunities has been provided in the market overview section. This section of the report also provides market attractiveness analysis and market share analysis by key players, thereby presenting a thorough analysis of the overall competitive scenario in the global urinary incontinence treatment devices market. Major players operating in the global urinary incontinence treatment devices market are Boston Scientific Corporation, C. R. Bard, Inc. (Becton, Dickinson and Company. ), Coloplast Group, Promedon Group, Medtronic plc, and Ethicon US, LLC. (Johnson & Johnson). These players exhibit significant geographical outreach with presence in multiple urinary incontinence treatment devices segments. Other prominent players in the global market include ZSI Surgical Implants S.R.L., InControl Medical LLC, Hollister Incorporated, Atlantic Therapeutics Group Ltd., B. Braun Melsungen AG, A.M.I. GmbH, and Teleflex Incorporated.